Real GDP grew at a seasonally adjusted annual rate of 0.7% during the first quarter of 2017, according to the Bureau of Economic Analysis’s “advance” estimate, down from 2.1% in the fourth quarter. The deceleration in real GDP reflected a deceleration in personal consumption expenditures along with drawbacks in private inventory investment and in state and local government spending. These were partly offset by an increase in exports and higher fixed investment. 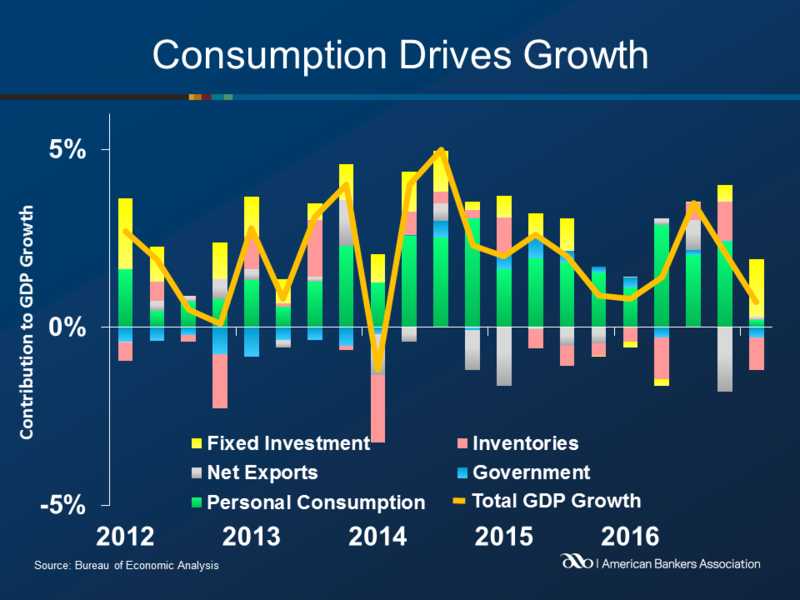 Consumption, usually the largest contributor to GDP growth, accounted for only 0.2% of the gain, down from 2.4% during the fourth quarter. Consumption spending increased to an annual rate of $11.7 trillion, up $9.7 billion from the preceding quarter. Fixed investment was a strong contributor, adding a total of 1.6% to GDP. Inventories, on the other hand, subtracted 0.9% from the growth. Government spending decreased during the quarter, as both federal and state and local government spending were down. Government spending decreased by a seasonally adjusted and annualized $12.4 billion. Net exports were positive, adding 0.1% to GDP.